An outstanding form, Liriope Emerald Cascade from Yamina Collectors Nursery, has wonderful green strap like foliage, glossy and long arching or weeping in form. Reaching around 30 – 40 cm this form is excellent in a container where the foliage can be allowed to weep down. In full sun the foliage will tend to change to have a bronze tint. Over time it will form a dense tight clump. 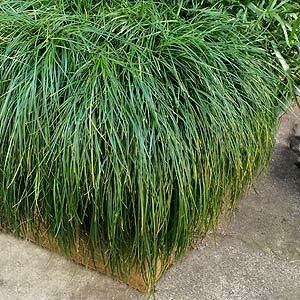 On of the real assets of Liriop ‘Emerald Cascade’ is its ability to grow in a shaded position, well suited to growing beneath trees, along fence lines where sun is a problem or as an indoor plant for shopping centres. Excellent both in the garden as well as when grown in containers this is one of the very best Liriope cultivars. Like most Liriope cultivars and maybe more so, Liriope muscari ‘Emerald Cascade’ is low maintenance, relatively drought tolerant once established and copes well with poor soils, although it will perform better with some fertiliser applied in spring. Flowering is in spring, but are not the main feature, the foliage of ‘Emerald Cascade’ is what it is all about.